2017 is here and it’s time for me to roll out my resolutions for this coming year, now one of the main reasons I started this blog in the first place was to give me the impetus to get my lead mountain painted and though it has helped me shift a reasonable portion of it I’ve decided this year to have a bit of a “push” on it and hopefully clear the decks considerably before I get stuck into any new projects. To this end I have come up with a fairly ambitious plan, I am not going to buy any new figures in 2017! Radical, yes, impossible, quite possibly, but hopefully not. This does not cover presents (though it is by birthday in two weeks’ time and I don’t plan on getting any for this), or does it cover any scenery items or supplies (brushes, paint etc..). Now I’ve had a look through the figures I have and I think I’m sorted for Mo’vember, Zomtober, Forgotten Heroes and March’sters of the Universe, so I can still take part in all these fun little side projects during the year, so we’ll see how this pans out over the next twelve months (it would be a great help if you lot would refrain from tempting me with gorgeous painted miniatures, so please bear this in mind on your own blogs, thank you). 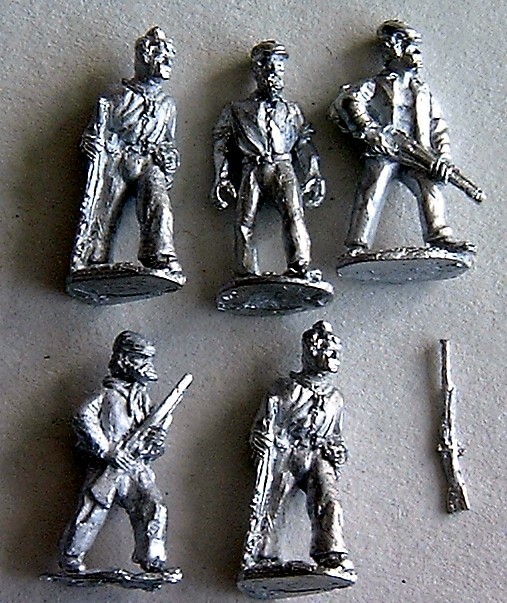 As I’m sure you all know by now these figures were produced by Irregular Miniatures, and to add a tiny bit of variation to my “horde” I sanded the heads on the two bareheaded chaps slightly before adding flat caps with a little greenstuff. They were then all glued onto tuppences, had their bases built up with filler and were whipped out into the garden for an undercoat of matt black. Painting then ensued with the guns receiving a dry-brushing of chainmail to begin with. The stocks were then painted chocolate brown and highlighted with butternut. Turning to their trousers next undercoats of either dark grey, chocolate brown mixed with a little black of butternut mixed with coffee were laid down and these were then highlighted with blue grey, chocolate brown or coffee respectively. I also did a few of the caps at the same time. Shirts as always were either undercoated in coffee or blue grey then highlighted with cream or pale blue. Turning then to the “fleshy” bits an undercoat of European flesh was applied and after their eyes were added in black and white, a highlight was added in European flesh again this time mixed with a little pale flesh. The one chaps blazer was them painted in royal blue with a touch of black mixed in and highlighted with just royal blue. Boots, belts and baggage was then either painted black or chocolate brown and dark grey or leather highlights were then added to these. A couple of neckerchiefs were then added in either dark/pink burgundy or deep bronze green/light green, and finally I added their hair in chocolate brown, chestnut or citrus orange highlighted with chestnut, orange or lemon yellow respectively. 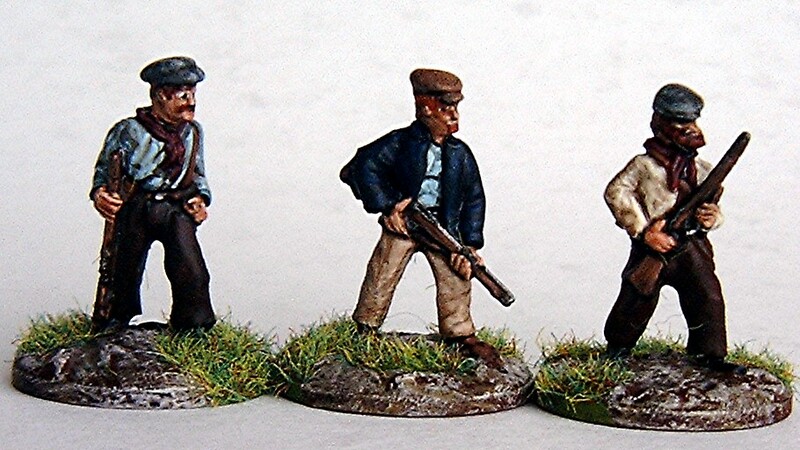 Next day they were all given a coat of Quickshade mid tone and the day after this the bases were first painted in chocolate brown before this was given a heavy dry-bushing of khaki and a lighter dry-brush with coffee, then areas were picked out in scenic green and these areas were then “flocked” with summer mix “hairy grass”. Finally they were sprayed with matt varnish. Great start to the New Year Roger, and my best wishes for your New Year’s Resolution… Will I therefore see you at Salute? 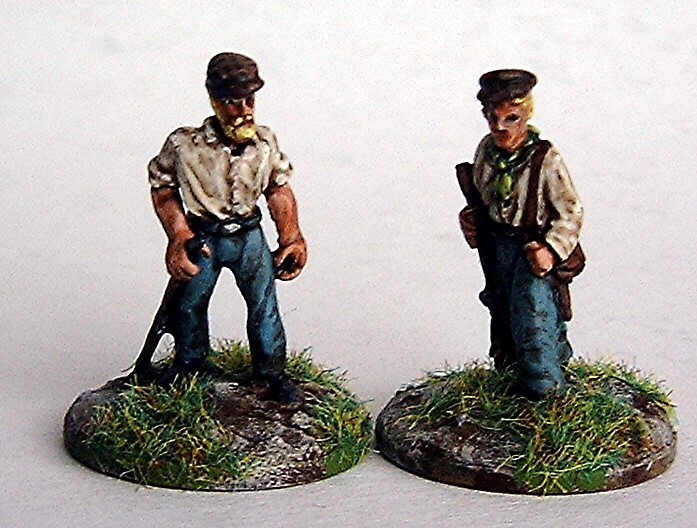 Five more grand additions to your increasing “VBCW” and some nice little conversions to boot. No Salute is a no go this year, Myles has made it known that he doesn’t want to go this year, and so I don’t think I’ll be attending any shows this year. Well that’s rather depressing new tbh… I was looking forward to sharing a cuppa with you (and Jez) before the Blogger’s Meet; especially as last year I barely had time to say hello. Perhaps a trip for myself up North is in order for later in the year? Sorry Simon, but it’s a long trip down to London if I’m on my own, and it’s a big outlay of cash not to come back with bags full of booty. I hope not to buy anything I just can’t justify it (even if I might finally get my cuppa from Jez!). You would of course be welcome up here, though we can’t compete with the likes of Salute with our shows (we barely ave tha’ new fangled electricity , up ere’ tha no’s). Very nice paint jobs on these, Roger. I wish you well with your New Year’s resolutions but I suspect you’ll need a load of willpower to achieve it. Perhaps a more realistic goal might be buy less and paint more. Anyway, all the best. Thanks Bryan, I’m an all or nothing type of guy, and nothing is what I hope to buy (I am also sadly very weak willed, so don’t be surprised if I fold like a house of cards too). Cracking start to the year, but your new year’s resolution sent shivers done my spine! No new lead, brrrr! Best of luck nonetheless, but sorry also to hear that you will not be attending Salute this year, I was hoping to thank both you and Jez in person for generosity. Many thanks Michael, I was thinking it was a good idea, but now you lot have put the fear of god into me! Hopefully you’re all just weak willed, and I will prove me mental superiority of the lot of you (Hmmm, I wont count my chickens though;-)) . The plan was always to go to Salute every other year, though we broke that one last year by doing two on the bounce. My wife has now suggested that we could go down for the weekend perhaps. So though I still don’t plan on going there is a glimmer that I might end up there yet (that will really test my resolution!!). Thanks Jez, as I say it’s a long way to 2018 but I hope to stick to it longer than most people keep up with diets and jogging. You wont be doing March’sters! with out your support I might give it a miss myself, I’ll see how I feel nearer the time then. If I don’t make it to Salute, please raise a glass (or plastic cup) to me as I’ll be there in spirit.